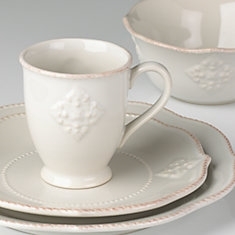 The French Perle Charm 4-piece Place Setting is surprisingly sturdy stoneware, as versatile as it is beautiful. This dinnerware is fancy enough for formal occasions, and casual enough for everyday. Diameter: Dinner Plate 10 3/4", Accent Plate 9"
Capacity: All Purpose Bowl 20 oz., Mug 12 oz.